I originally made this dish in my Food Science lab during fall semester using seitan, a meat substitute. The entire lab was really interesting, since it was based on using meat-substitutes. We used tofu, seitan, tempeh, and beans to make a huge variety of delicious dishes. This one was my favorite, and I decided to recreate it at home. While I enjoyed the seitan, I opted to use pork, since that was what I had on hand. Since then, I have also made this dish with chicken – both are very good! Heat oil in a large skillet over medium heat. Add pork and cook until browned, stirring occasionally. Add the bell pepper, onion, and garlic. Cook until tender-crisp, stirring occasionally. Stir in the pineapple juice, brown sugar, vinegar, soy sauce and cornstarch. Reduce heat to low; cook and stir until thickened. 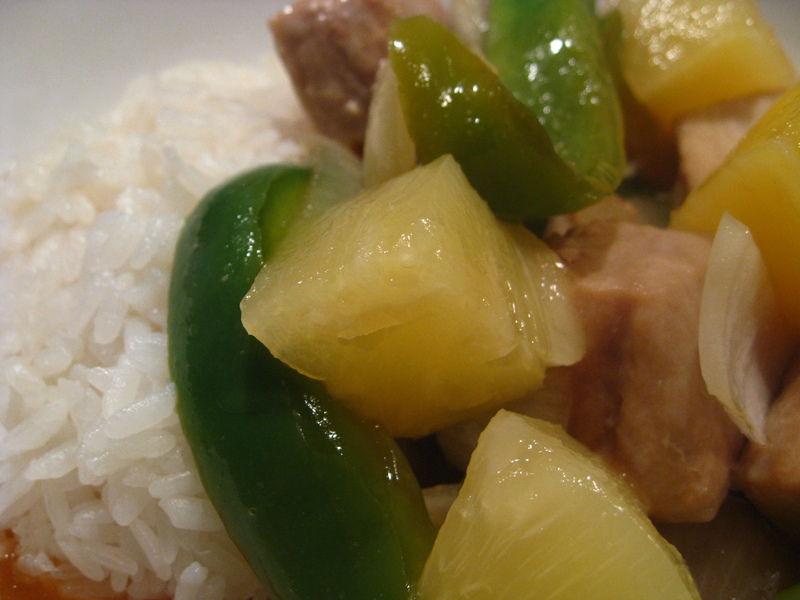 Mix in pineapple chunks just before serving. Categories: Dairy Free, Gluten Free, Main Entrees, Meat, Pork, Quick & Easy, Special Diets | Tags: Asian, chicken, main dish, meat, pork, quick and easy, vegetables | Permalink. This dish was amazing! I’ve never been a fan of warm pineapple until this dish and now it’s one of my favorites. Thanks for posting it! Made this last fall and was craving it again tonight – it didn’t disappoint! Glad to see you’re back to the regular blogging. I have a lot of recipes to catch up on!